The culinary art of the Tajik people had been forming for many centuries. Despite some similarities of national Tajik dishes with the dishes of other Central Asian peoples, the Tajik cookery at the same time has its own peculiarities, the original kind of technology of cooking many dishes. The most characteristic feature of the Tajik cuisine is the usage of meat products in a large quantity and the limited use of fish, eggs, certain types of cereals (buckwheat, oat, barley). The most accepted types of meat are lamb, goat, rarely hen and chicken; and almost completely ducks and geese are eaten. In some regions game, for example, partridge and quail are popular. The horse meat is usually used for cooking the sausage “kazy”. 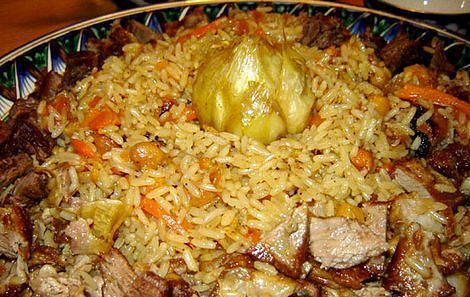 Another peculiarity of the Tajik cuisine is the overconsumption of legumes and rice. The significant proportion in the food ration consists of flour, they are: flat bread, lagman, ugro, sambuse, khvorost and others. Primary and cooking some food are distinctive. For many dishes, for example, meat is used without pre-boning. For cooking first courses meat with bones is cut beforehand and fried. With this method the ready meal assumes a peculiar taste and brown color. The skin of poultry is removed before or after the heat treatment. Fish, meat and vegetables are fried in a great deal of the hot fat. Fats, especially cottonseed oil, is previously overheated to a temperature of smoke formation with the addition of onion (whole heads) and meat bones. The treatment of some kinds of vegetables is also typical. For example, the rhizome of onion is cut in the form of the cone. Potatoes and carrots for first courses are boiled as a whole. The products are exposed to heat treatment in the iron pots - cauldrons, and in special pans - mantovarkas or pans with the liners, on the grill and in the tonurs. Food frying on the grill, in the tonurs makes a special taste and smell to ready dishes. Thanks to cooking on the steam, ready meals do not lose their nutritional value, mineral salts and vitamins are stored in them, meat becomes delicate and has a piquant taste. 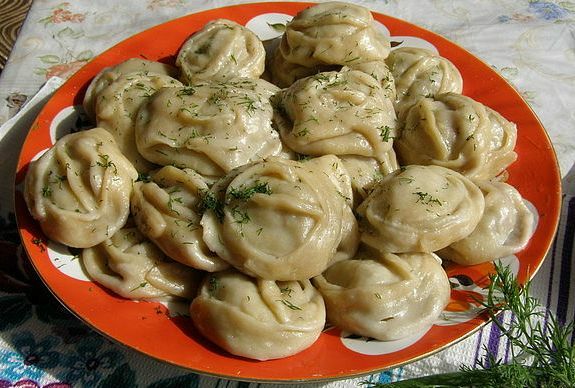 Most Tajik dishes are abundantly seasoned with onions, spices, herbs and sour milk (katyk). Such spices as red pepper, zira, barberry, anise, saffron and others are widely used. Heady herbs (coriander, dill, parsley, mint, raykhon, green onion, sorrel, etc.) are added to salads, first and main courses, and sour milk in the grinded form. Instead of tomato sauce fresh tomatoes are preferred for filling first courses. Besides, suzma, sour milk, sour cream and kurut are used for filling soups and salads. Salads of fresh vegetables, pomegranate seeds, rhubarb, and radish are separately served to main dishes. The peculiarity of the Tajik cuisine is a semiliquid consistency of the main dishes, a large amount of meat sauce "vazhu," and the density of the first dishes. The national tableware includes tea bowls of different capacities, kasy, round and oval dishes, pottery teapots, trays, bowls and other kinds of wooden and ceramic plates and dishes. The favorite drink of the Tajik is green tea. Neither reception of guests, nor a friendly meeting and conversation go without a tea bowl of this hot drink. Even the dinner begins with tea. Bowls with tea are served on the trays. The tray with sweets, fruits and flat cakes are served separately. Then, the soup is served in large bowls, and main dishes are served in large round dishes. Vegetable salads are usually served in small plates as the addition to main courses. The Tajik eat meal sitting on the sofa round low tables. 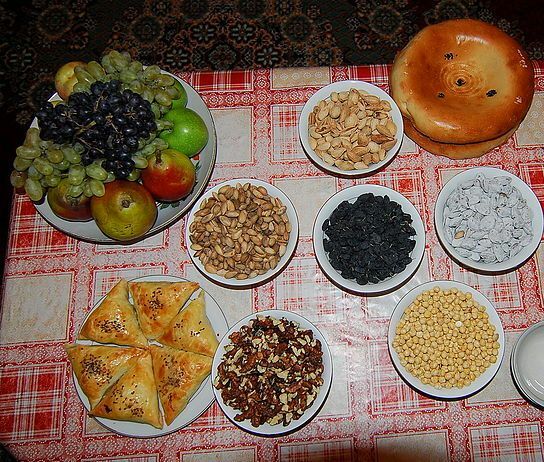 It should be noted that the Tajik have a respectful and considerate attitude to food, especially bread; one is ought not to throw and drop bread to the ground or floor, it is not appropriate to put it on the tablecloth (table) upside down; you should break it carefully.